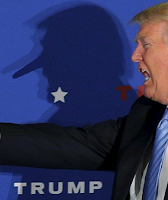 Donald Trump has been lying his way through the entire presidential campaign. A position could not be considered distinctively Trump's unless it was supported by lies and energy is no exception. By way of supporting his energy policy Trump has rattled off a long list of falsehoods. Now that Trump's political obituary is being written and we are all catching our breath after dodging his fossil fuel powered bullet, lets take a look at some of Trump's energy lies. As reported by Ben Adler in an October 10th Grist article, here is a review of some of Trump's energy lies from the second debate. Trump said, "energy is under siege by the Obama administration. … We are killing, absolutely killing, our energy business in this country." No, its not. as Adler points out, "total U.S. energy production has increased for the last six years in a row. The oil and gas sector has been booming during the Obama presidency, as have the solar and wind industries. Coal companies have been struggling — but that is largely not the fault of President Obama, just as the oil boom is largely not something he can take credit for." Trump suggested that by supporting the expansion of fossil fuels he will "pay off our national debt. They will pay off our tremendous budget deficits." Adler responds saying: "There is no remotely credible economic analysis to suggest that Trump’s proposals for expanded domestic fossil fuel extraction would generate enough additional tax revenue to close the budget deficit, much less pay off the existing national debt. It’s particularly implausible when you consider Trump’s massive tax-cut plans that would make both the deficit and debt considerably larger." Trump also tried to say that he supports alternative energy saying, "I’m all for alternative forms of energy, including wind, including solar, etc." He went on to say: “There is a thing called clean coal … Coal will last for 1,000 years in this country.” Adler once again sets him straight saying, "Trump’s energy plan offers nothing to increase solar or wind energy production, but instead focuses on boosting fossil fuels." Adler also takes Trump to task over "clean coal" saying that, "no one has actually significantly cut emissions at an economically viable coal plant. The promises of clean coal projects have not been fulfilled."